I was Born into a Roman Catholic family, but did not initially like attending church. At one point in my journey, I made a deal with my parents that if I got confirmed, I could stop going to church, which I did. I didn’t darken the doors of a church until I was 19 years old, when I asked a girl out on a date. She said yes – but only if I’d go to church with her. This was my first time attending an Episcopal church; St. David’s Episcopal Church in Pittsburgh. The liturgy was familiar, so I was comfortable with that, but the church just had an excitement and this feeling of being alive that I hadn’t experienced before. So, I decided to check things out further, eventually finding community and purpose. One might say that I had found a home and decided to dive right in! A year later, I joined a mission organization and started travelling the country, doing short-term work in several cities. Additionally, I also spent time in Mongolia, where I lived in a yurt on mountain with no running water or electricity for two months. I was 21 when I first felt called to the priesthood, but I felt like God said, ‘You need to let that go for now; you’re not ready yet.’ And so, I let it go and began working as a youth minister beginning in Pittsburgh and eventually winding up working in a Lutheran church in Arizona. While there, I always said that while I may be working at a Lutheran church, I’m always an Episcopalian at heart. Eventually, the Episcopal Youth Diocesan Coordinator heard about me and asked me out to coffee. When he found out I was an Episcopalian, he urged me to meet the bishop of the Diocese of Arizona, Bishop Kirk Smith. A week later, I was in the bishop’s office and he asked me for my story and after hearing it, if I ever considered ordained ministry. It had been 10 years since I first felt a calling to the priesthood, and I was about to finally begin the discernment process. I always knew I was going to be a priest someday, so entering discernment process felt like coming home. Throughout this process, I was mentored by several amazing priests, including Nick Knisely, who at the time was the dean of the cathedral in Phoenix and is now the bishop of Rhode Island. After two years of discernment, I attended Virginia Theological Seminary (VTS), where I developed a love of church history, especially the history of gospel writings and the first seven Ecumenical Councils. However, it would also seem I had some growing edges. During seminary, when I’d get my papers back, all of my professors used to say, ‘Kenn, you’re writing too conversationally; you need to write more academically.’ I’ve found however that, while writing conversationally might be bad for papers, it seems to be really good for preaching. I may never lecture at Harvard or Yale, but those who hear me preach never complain (well, hardly ever I hope!) about being bored. 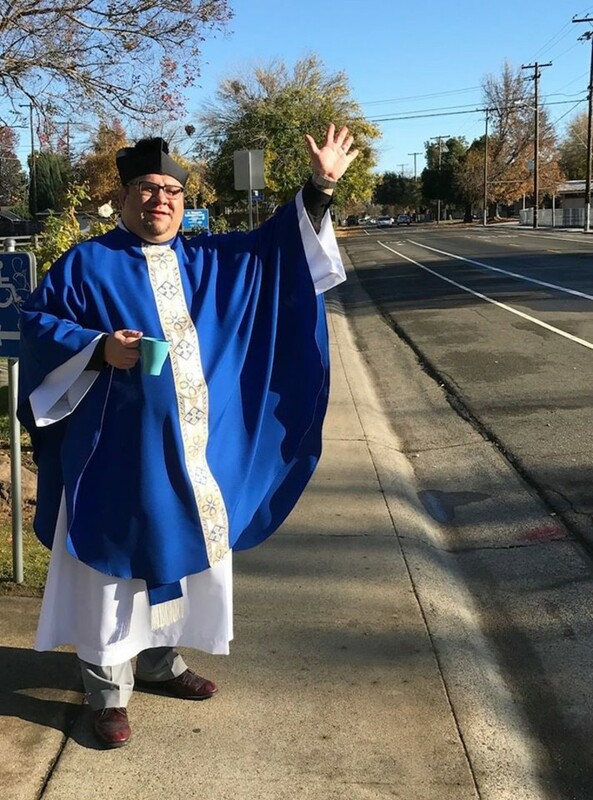 When my wife Theresa, received a job opportunity in Sacramento, we left our home in Arizona, and we have found a wonderful new church home at St. Clement’s. 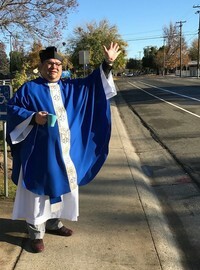 There’s a lot of work to do at St. Clement’s, but I’ve always viewed myself as a bit of a sparkplug, so I hope to energize, and bring a new vision of God’s heart for our church and community. I also love to meet with people for coffee and conversation, so please don’t hesitate to call! If you are in need of pastoral care, please contact Fr. Kenn at kenn.katona@gmail.com or call 916-635-5282.